Norway’s anti-doping agency has determined that top skier Therese Johaug should be suspended for 14 months after she tested positive for a steroid in September. Anti-Doping Norge’s committee that prosecutes doping cases claimed that Johaug is to blame for not checking the contents of a cream she used to treat sun-blistered lips. Johaug was sentenced “to the loss of the right to take part in competition and organized training, along with the right to hold any elected positions, for a period of 14 months.” The suspension would begin from the day she was suspended on a preliminary basis, October 18, 2016. The committee, appointed by Anti-Doping Norge’s board but independent of the agency’s administration, will now forward its decision to the judicial commission of Norway’s national athletics federation (Norges Idrettsforbund, NIF), which is charged with evaluating and implementing a final verdict. When it formally receives the recommendation from Anti-Doping Norge, Johaug will be given three weeks to appeal. Johaug stated that she was glad the committee “has believed what I have said,” regarding how she came to receive and use the lip cream. 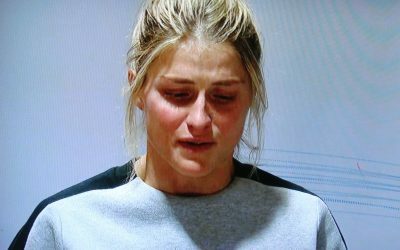 She objected, though, to the length of the sentence, which will not only ruin this year’s ski season for Johaug but also extend into next year’s. “I can’t understand that what happened is just cause for being shut out for 14 months,” Johaug responded. The lip cream called Trofodermin had been given to Johaug by the national team’s doctor, who bought it at a local pharmacy in Italy where the team was training last summer. It was found to contain klostebol, an “eksogene anabole androgene steroid” that’s on the World Anti-Doping Agency’s list of banned substances. He added that it would take “a few days” to complete the committee’s documentation before it would be sent to NIF.